Are you interested to enhance the guest experience with technology? Technology is a powerful tool, but hotels still don’t use it to its full potential. Hotels must put their best foot forward in providing the best guest experience, and nowadays this requires a personalized approach that can be easily achieved with the use of the technology. 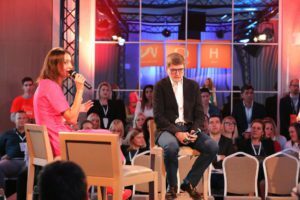 At the beginning of October, we attended the HOW festival in Poreč, Croatia to check what hotels have to say about the use of modern technology and the digitalization of processes. The main goal of the festival is to present global operations trends in hotels, and to encourage them to implement new products and services. Another excuse to visit the festival was to gather valuable intel from presentations and panel discussions about hotel operations, because that helps us build solutions that solve the real problems hotels face, and also helps improve staff and guest experience. To summarize, the overall message is that hotels should enhance the guest experience, and give guests an extraordinary and personalized experience that will go beyond his/her expectations. They all agreed that providing that experience would require the ongoing training of staff which is already underserved. As a guest experience designer at Nevron IPTV, I saw an opportunity where the IPTV solution in the hotel would benefit not only the guests, but also the staff. You must be wondering how. . . .
It’s true that Nevron IPTV solutions, like any other, are mostly focused on providing info, entertainment, and experiences for guests. The aim of the digitalization of such services is to lessen the burden on staff so they can focus more on personalized guest experience. Panelist Srdjan Milenkovic, Senior Vice President of Operations for EAME from Hyatt International, gave great insight how to use this saved time – that, for example, a receptionist could use it to provide guests with more valuable interactions. Instead of staff giving info where certain services are located, they could simply ask how their day is, or how they have enjoyed the hotel services so far. This means that the value of the staff is maximized, and the experience of the guests are taken to another level. Another panelist Sabina Bartyzel, Area Manager in Hungary for Accor Hotels, mentioned that even a simple change can cause troubles or stress for staff. An IPTV solution can actually ease the troubles involved in this learning path by only delivering valuable training content to the staff of the hotel. Panelist John Bartlett, Head of Performance Reporting & Insights for EMEA at InterContinental Hotels Group, said that one of the required elements for True Hospitality is a knowledgeable and skillful staff. This knowledge and skill is the basis for confidence, and helps them perform their role. Source: HOW Festival – Talking how to enhance the guest experience with technology in Porec, Croatia. When you first started a job you probably remember the amount of time and brainpower you used to learn new things, and wondered if you were doing things the right way. Later, through gained knowledge and experiences, your learning curve decreased and you could redirect that energy on improving your performance – which means making guests more satisfied with a personalized approach. Join me also next week for Part 2, where I will mostly focus on technology for guests and how it can directly help you achieve memorable guest experience.